Yixian Zheng at the 2013 ASCB Annual Meeting. Photo by Kathy Anderson. Yixian Zheng isn’t afraid to challenge assumptions in biology. She studies how cells divide and wants to know what is orchestrating the process, but her ideas haven’t always been immediately embraced. This month her lab at the Carnegie Institution for Science in Baltimore has published three papers in which Zheng’s lab identifies new regulators in spindle assembly, all associated with the spindle matrix, a structural scaffold that promotes mitosis. The problem here is that many scientists aren’t convinced that the spindle matrix exists. In one of these new papers, Zheng begs to differ. The trouble with the spindle matrix, unlike the spindle itself, is that you can’t see any defined structure using electron microscopy (EM). “But if you depolymerize microtubules, there is something that remains together, that’s what’s called the matrix,” explained Zheng. A few years ago Zheng and collaborators identified the proteins in the matrix. “We found a lot of proteins; of course, some have criticized that we essentially purified the cell,” she said. Now Zheng says that her lab is reaping the rewards of that search, and identifying the roles of some of the proteins they identified in mitosis, with papers this month in MBoC, JCB, and Cell. The paper she wrote with postdoc Hao Jiang and research associate Shusheng Wang, plus collaborators from Xueliang Zhu’s lab at the Shanghai Institute for Biological Sciences published in Cell explains why you wouldn’t be able to see the spindle matrix with EM. “We have been trying to think what kind of structure doesn’t have a structure under EM. That’s when I came across the idea of phase transition,” Zheng said. Protein phase transition can lead to the formation of liquid droplets in which no discreet structures can be seen. One of the proteins Zheng was studying that is required for spindle assembly, BuGZ, had elements similar to that of the protein, elastin, which has been shown to undergo phase transition to first form liquid droplets and then elastic fibers. “In the in vitro assay [with BuGZ], we found liquid droplets that are temperature dependent,” Zheng explained. “BuGZ has a lot of hydrophobic amino acids, but they do not cause protein precipitation, because they are dispersed with proline residues, similar to elastin. Unlike elastin the BuGZ droplets do not appear to further assemble into filaments. Basically, we show that BuGZ undergoes temperature dependent phase transition to form droplets. The binding of BuGZ to microtubule promotes BuGZ to undergo phase transition. The phase transition property of BuGZ is required for the assembly of the spindle matrix.” Zheng said. If the spindle matrix is formed by the phase transition of proteins like BuGZ, one would not see structures like you do with microtubules or actin. Zheng has been working on microtubule assembly since she was a graduate student in Berl Oakley’s lab at Ohio State University, Columbus, Ohio. She then went on to purify the gamma tubulin ring complex (gTuRC) as a postdoc in Bruce Albert’s lab, at the University of California in San Francisco (UCSF), with help from Tim Mitchison, who was then at UCSF. 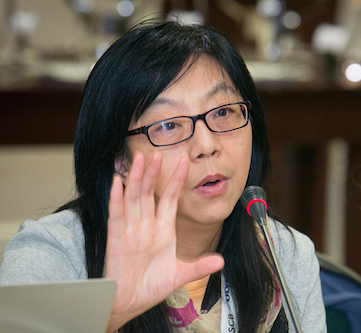 A long-time supporter of ASCB, Zheng is the chair of ASCB’s International Affairs Committee. Christina Szalinski is a science writer with a PhD in Cell Biology from the University of Pittsburgh. “ASCB®,” “The American Society for Cell Biology®,” “ASCB AN INTERNATIONAL FORUM FOR CELL BIOLOGY®,” “Molecular Biology of the Cell®,” and “DORA®” are registered trademarks of The American Society for Cell Biology. “The Cell: An Image LibraryTM” is a common law trademark of The American Society for Cell Biology.